An okay match. The story here was all about Baron Corbin not wanting to be a part of a team. He refused to help the Dudleyz and would tag himself in whenever he wanted to. Whenever he would pull his shenanigans it would bog the match down. Otherwise, it was fine. Clips of the non-finish in the title match from RAW this past week. Pretty good match. Kalisto kept the energy and pace up, but Viktor also looked good here. He was a little bit of a prop for Kalisto, but he hung in there. This was fast and entertaining. Pretty good match. Breezango worked great as a team, as usual, and Swagger and Henry were fun to watch as a powerhouse team. Good match. Kind of a typical eight-man with a typical breakdown at the end, but it was fun. This was an entertaining show. Four good matches and lots of people on it, which makes sense since this is the last Main Event before the draft takes effect. 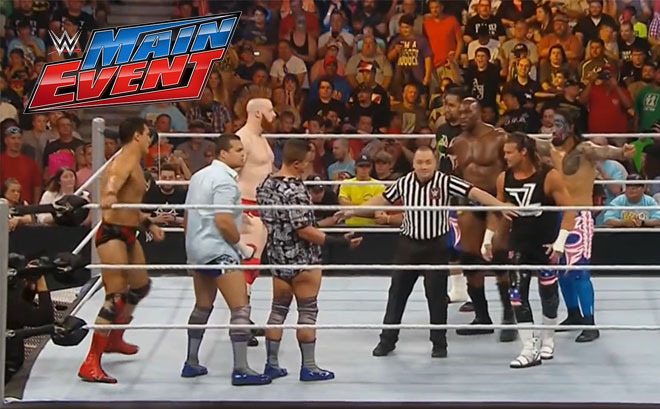 You can’t ask for much more from Main Event. All the matches on this show were fun (if somewhat standard), but I liked the breakdown in this one the most.